Note that this is not "The" Hofner bass, but a right hand Hofner bass. Thank you for mentioning this. 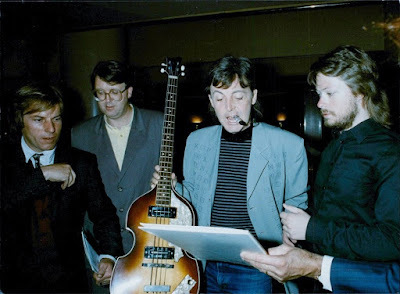 Some might think that it is THE Hofner. I guess I should have said something in the captions. it's a nice looking Hofner, though. it's at least a 1968 model, or an early '70s bass. more than likely, he signed the pickgaurd, just like he signed mine, in 2002 (with my late '70s bass).